NBA 2K18 is scheduled to debut on store shelves until September 15th for those that who pre-order. It'll come to Xbox One, PS4, Windows PCs and mobile. 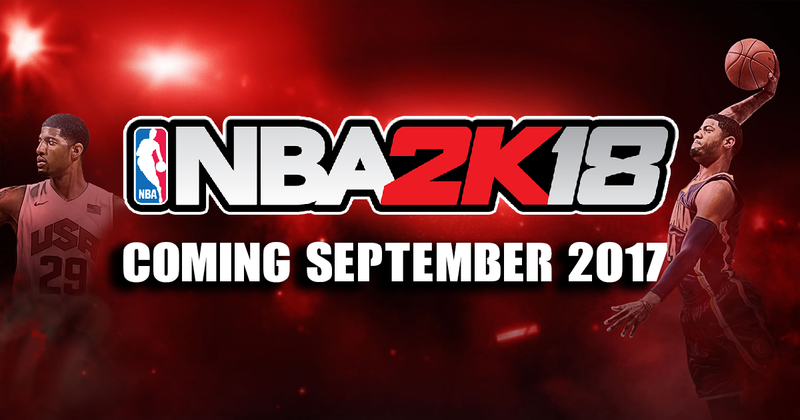 You must have noticed some NBA 2K18 version informations to help you to decide which version of NBA 2K18 is the one to pre-order now or purchase on release day. NBA 2K18 Standard Edition is for mild fans of the series that don't care as much about Virtual Currency as they do getting access four-days before everyone else. Standard Edition is $59.99. Buyers get 5,000 in Virtual Currency, 10 Weeks of MyTeam Packs and some MyTeam themed cosmetic items for use in the game. This version will come to the Xbox 360, Xbox One, PS4, PS3, PCs and the Nintendo Switch. 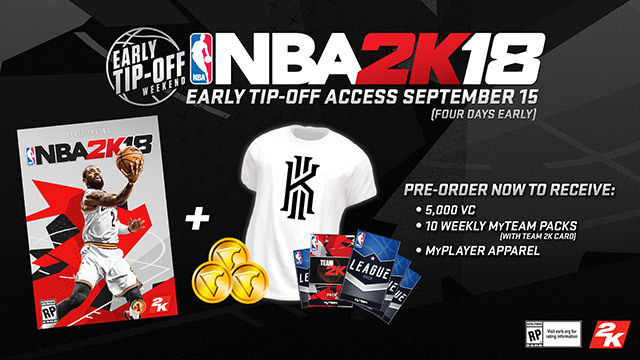 This version of the game gets you access to the NBA 2K18 Early Tip-Off Weekend, provided you place a pre-order before September 15th. 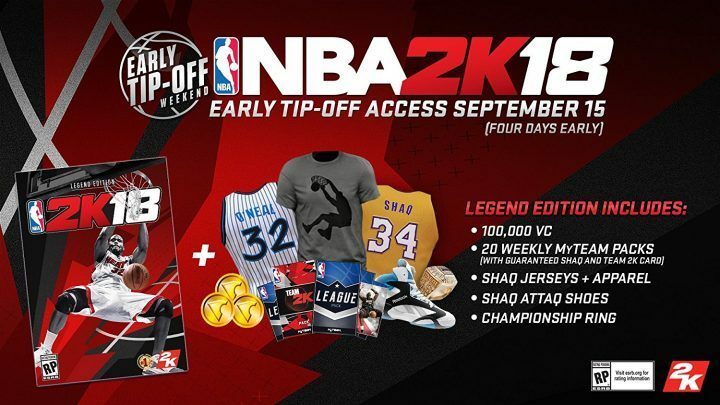 NBA 2K18 Legend Edition is the upgraded version of the standard game and the version is for big-time fans of Shaq. It’s also for anyone that loves MyCareer and wants an early jumpstart to their character. It doesn’t come with any exclusive features. Instead, it packs Virtual Currency that could make starting out in MyCareer a little easier. Legend Edition is $99.99. There’s 100,000 in Virtual Currency included with Legend Edition. Again, you can use Virtual Currency to buy upgrades for your character in the game. The more Virtual Currency you have, the easier it’ll be to get extras in MyCareer. 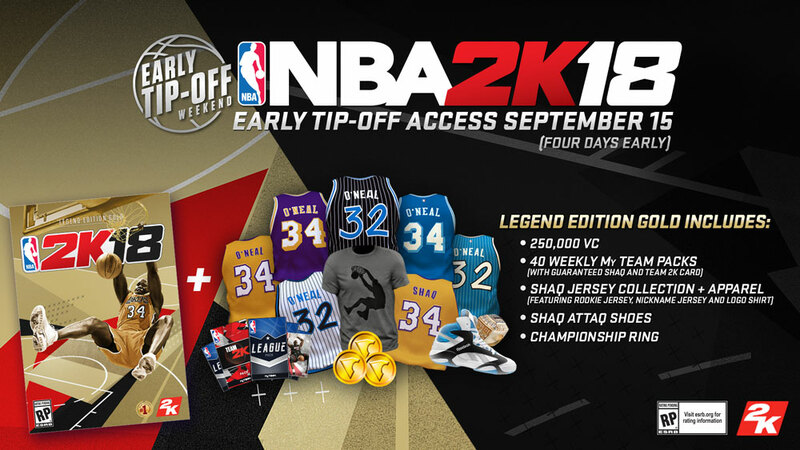 Character add-ons include a Shaq Championship Ring, Shaq Attaq shoes, Shaq Jerseys and Shaq clothing. There are 20 weeks of MyTeam Packs instead of the 10 that the basic version comes with. Physical copies of this game come with 5 Panini cards, Shaq MyTeam Stickers and a poster. Xbox One, PS4, PCs and the Nintendo Switch will get this version. This version qualifies for Early Tip-Off Weekend. NBA 2K18 Legend Edition Gold is for the player that enjoys the series year after year and will find themselves spending hours across MyCareer and MyTeam modes for a long time. It’s also for the fan that loves basketball games and doesn’t have a lot of free time to dump into the game to earn Virtual Currency. This version costs $149.99, the most that any version of the game does. Shoppers get 250,000 in Virtual Currency when they buy Legend Edition Gold. There's 40 weekly MyTeam Packs. Developers guaranteed that players who own those packs can get at least one of Shaq and a TEAM 2K Card. Buyers also get the Shaq Attaq Shoes, the championship ring and Shaq Themed Jerseys and apparel. Physical add-ons include a poster, 10 Panini Cards, Shaq MyTeam Stickers and a lenticular printing. Nintendo Switch, Xbox One, Windows PCs and PS4 will get this version. The game qualifies for Early Tip-Off Weekend. In order meet player's demand for NBA 2K18 MT during Early Tip-Off Weekend, we decide to bring forward the activity where offers coupon code "NBA2017". You can buy NBA 2K18 MT from now on to gain up to 5% off.